On the Great British Baking Show, a tray bake is a homey cake baked in a rectangular pan. For me, it’s a catch-all for one pan meals cooked on a baking sheet. For this Provencal-inspired chicken tray bake, we coat flavorful chicken thighs with a light crust of herbes de Provence. 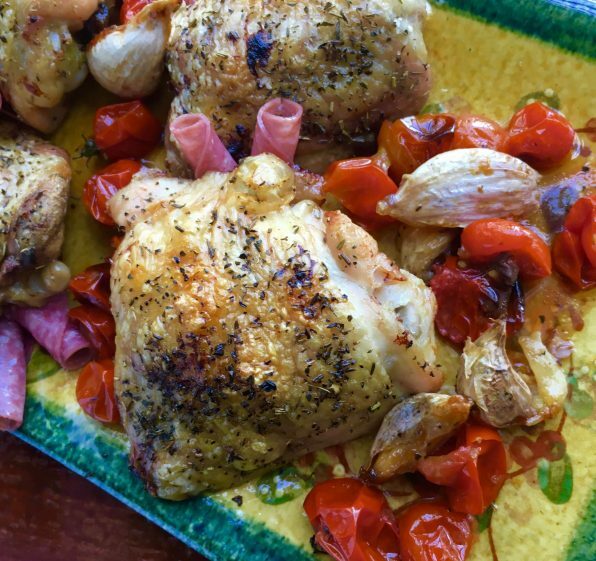 Thighs withstand longer cooking than breasts so they are ideal for roasting with garlic and tomatoes. The pan juice makes a nice sauce. When the chicken is cooked, you can dress whole thing up with slices of dry-cured sausage, provolone and black olives. It’s easy and would be great for tailgating too. You can use cut-up whole chicken instead of thighs. And if you don’t have or cannot find herbes de Provence – it’s a blend of dried thyme, rosemary, lavender, marjoram – use a few pinches of dry thyme and oregano. Preheat the oven to 400°F. Line a baking sheet with nonstick aluminum foil or parchment paper. Trim and discard any excess fat and skin from the chicken thighs. Rub the chicken thighs with the olive oil. Season then with salt and herbes de Provence on all sides. Place them on the lined baking sheet. Tuck the garlic cloves between the chicken thighs. Add the cherry tomatoes. Continue baking until the chicken is crisp and cooked through, the garlic is softened and the tomatoes have burst, for about 10 to 15 more minutes. Transfer the chicken to a serving plate. Scrape the pan juices over the chicken. Scatter the garlic cloves and cherry tomatoes around the chicken. Roll up the slices of sausage and slices of cheese, if using into tight cylinders and tuck them in the chicken. Scatter olives over the chicken.